Sh2-129 is an extensive emission nebula visible in the constellation Cepheus. It is located on the southern edge of the constellation, to the northwest of the large nebulous complex IC 1396, although physically at long distance from it. 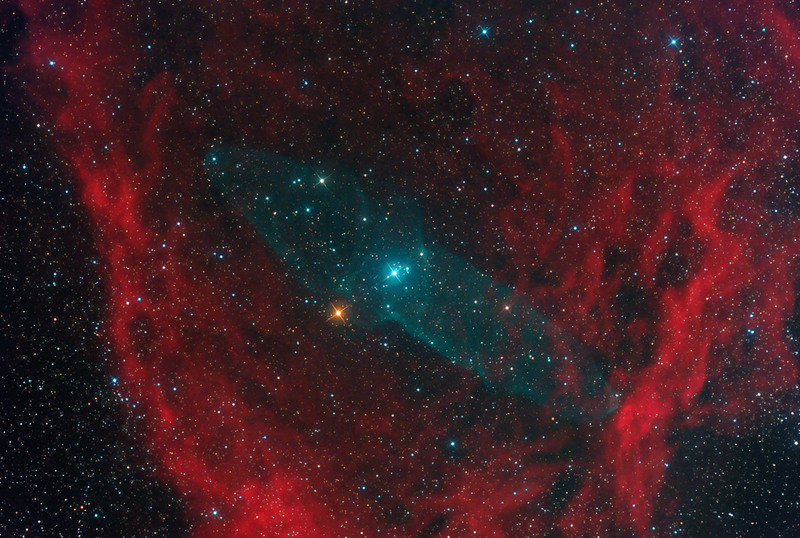 This nebula with its arch-shape is sometimes nicknamed Flying Bat Nebula. Its distance was estimated at about 400 parsecs (1300 light years). The surroundings of this nebula are particularly rich in molecular clouds, the first of the great dark nebulous system responsible for much of the concealment of the Milky Way in the direction of Cepheus. At the center of Sh2-129 is OU4 - a bipolar outflow possibly emanating from the triple star system HR8119, located in the center of the nebula. It was discovered by the amateur astronomer Nicolas Outters in 2011. The detection of this object (commonly called the Squid Nebula) is hard, because it is very faint and requires long exposures with OIII filter. Recent studies suggest that OU4 lies within Sh2-129.